Freshmen cadets beat Navy midshipmen in a forensics competition Oct. 6 at the Air Force Academy. 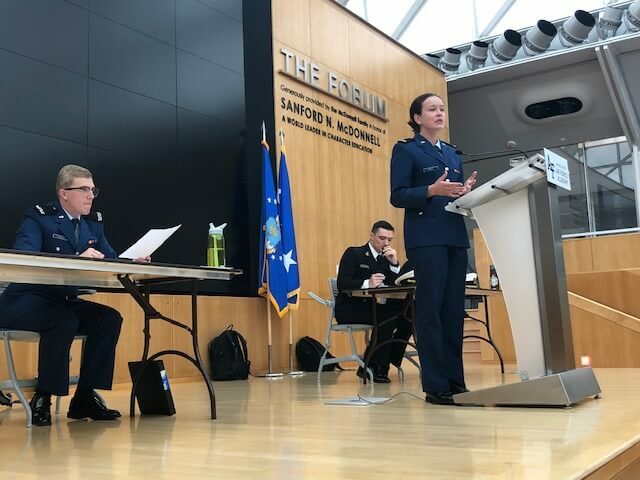 Cadets 4th Class Piper Gray and Shane Lindsey of the Academy’s Forensics Team won the debate challenge against two junior-year midshipmen to earn the top slot at the competition. Forensics is a debate contest between individuals or teams. The Saturday event marked Gray’s first official competitive debate. She said she was more than a bit surprised when the Air Force win was made official. Lindsay said the competition was fierce. Capt. Ashley Christ, assistant officer-in-charge of forensics, said a judges’ panel selects the winning team based on their rhetorical skills and ability to influence the audience of the strength of their argument. Christ said it’s rare for freshmen cadets to be pitted against their more-senior counterparts, but the Forensics Team had more competitions to content with. In all, 84 college forensics teams traveled to San Diego to compete in forensics competitions at Palomar College and San Diego State University. Cadets 3rd Class Henry Gilchrist, Mark MacKenzie, Adam Peck and Sarah Whitley broke to elimination rounds, and Cadets 4th Class Sebastian Crawford and Colin Jarrett-Izzy were semifinalists in the National Parliamentary Debate Association Division. Cadets 1st Class Samantha Potter and Ciera White took second place in the World Universities Debate. Gilchrist took second place in the impromptu speaking event and earned the highest record among competitors in the individual and debate tournaments.